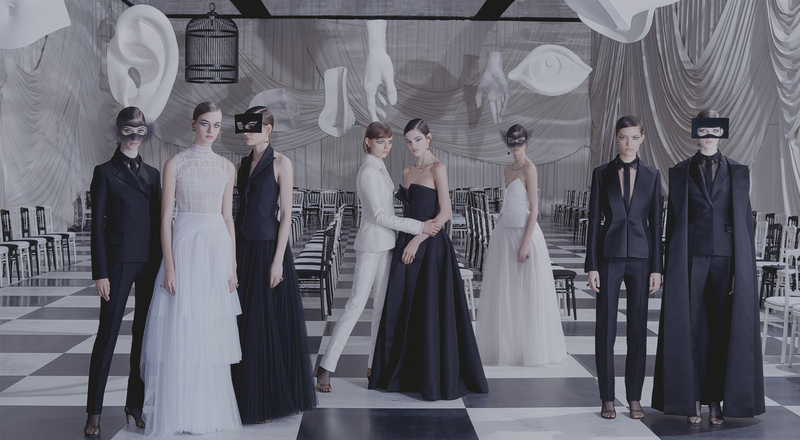 For her third haute couture season Maria Grazia Chiuri, Artistic Director of Dior women’s collections, unveiled a collection suspended between dream and reality, paying tribute to the Surrealist movement founded in the 1920s. 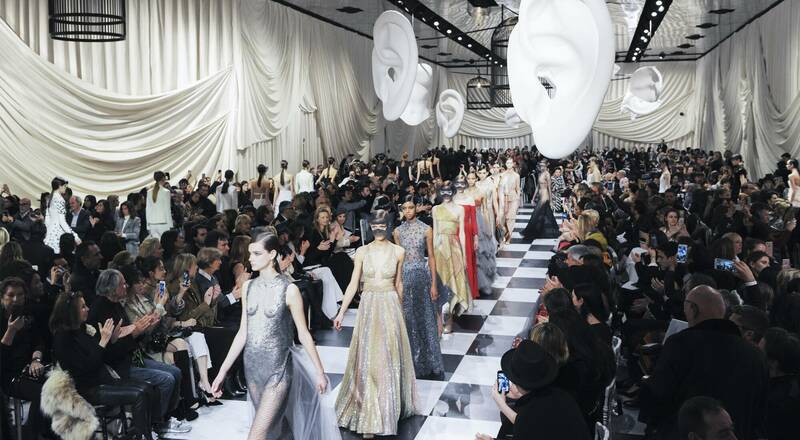 The history of haute couture is intimately linked with the history of modern art, just as the “atelier” designates both the artist’s studio and the studio where a designer works, but artists’ true studio is their spirit. This dimension and the works of Italian artist Leonor Fini provided inspiration for the Dior Spring-Summer haute couture collection created by Maria Grazia Chiuri. Inspired by Surrealism and situated somewhere between dream and reality, the mostly black and white collection did not reveal all its secrets on the first impression. The generous pleats on a white evening dress are etched in black and open like the pages of a book. Cages, a recurring motif in Surrealist works are transformed into a black mesh fabric that hugs the body and underscores transparency, as silvery fishnet mingles with the density of velvet. For daywear, Maria Grazia Chiuri proposes a series of suits, recalibrating Monsieur Dior’s curves for today’s tastes, paired with skirts of multiple contrasts. Delicate ornaments decorate a dress illuminated by a mirage of peacock feathers and embroideries embellish accessories. The looks were enhanced by the subtle and elegant makeup of Peter Philipps, Creative and Image Director of Dior Makeup.